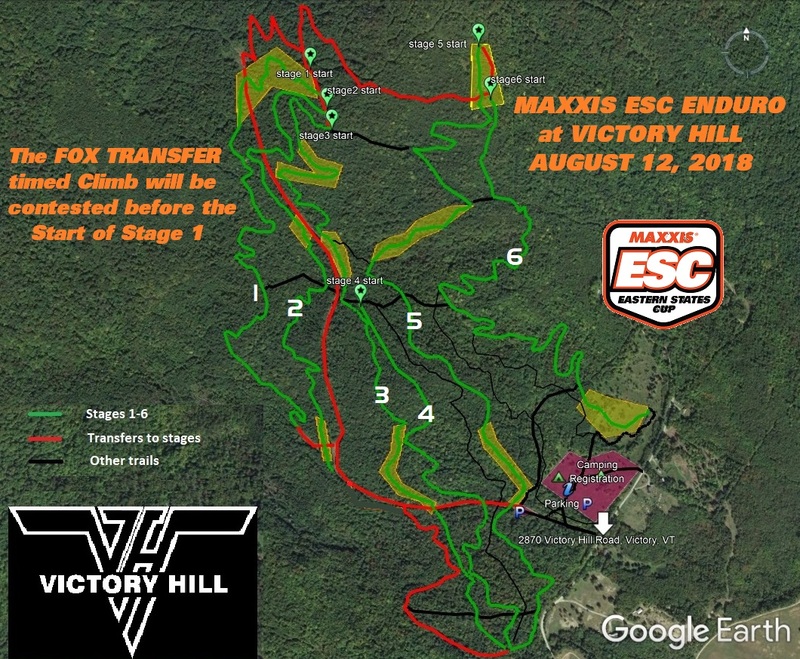 Victory Hill is the only privately owned non-ski area on the Maxxis ESC schedule. The owners have a clear vision of developing Victory Hill into a destination spot. They’ve worked with Knight Ide in developing the trails at the location into an enduro hotbed. We’re thankful and excited to be offering our third Maxxis ESC Enduro on Victory Hill trails this weekend. At this stop we’ll be racing on 6 Stages with some trails we have never braced on before. The climbs are relatively easy while the descents are technical and filled with features. Knight has been busy building at Victory Hill and we’ll reap the rewards! The tracks will be taped and open starting Friday for the racers that want to get some additional practice in. On Saturday morning the VT3 Stage race will be racing at Victory. This exciting two lap race concludes at 12:30. Maxxis ESC racers will be able to access the race trails on a rolling basis as the VT3 racers finish their race. All trails will be accessible starting at 12:30pm, practice will conclude at dusk Saturday evening. All this should make for a festival style weekend. Camping is a very reasonable $10 per vehicle for Saturday Night, payable at the Maxxis ESC tents. Camping Tags will be issued. Vehicles without a camping tag by Saturday 8pm will be charged the camping fee plus a $10 late charge or asked to leave the property. Of course, we don’t want to deal with that so please pay at registration. Camping tags are available on the pre-registration page or onsite. Please make sure to pick up your Saturday camping pass at Registration. Attendance is always great at Victory and it’s no difference this year so PLEASE pre-register to ensure yourself a starting spot for the event. Join us Saturday for the 4pm to 7pm sampling at the 10th Annual Burke Bike n’ Brew at Burke Mountain featuring live music, riding, bike games and sampling some of the best beers Vermont has to offer! They’ll also be pouring Rookies Root beer for designated drivers and kids of all ages. Maxxis ESC Racers get in for the discounted rate of $20!! Should be a great weekend, please get registered before we sell out! !